Stewart Warner 900AC series radio with 445-A speaker. Note missing knob & moved toggle. What makes a good weekend for you? Some would answer eight hours straight of football games on Sunday afternoon. Others would say climbing Mount Washington or a good 100-mile bike ride. For me it is my annual trek to the ECARA (Eastern Connecticut Amateur Radio Association) ham radio flea market. This year (2013) it was held on March 16 in Dayville, CT.
Dayville is to the north and west of me (I am in Hope Valley, RI, right on the CT border). My computer said that it would be a 45 minute ride. Never believe a computer or a GPS. In the old days I would take out my Mass/CT/RI map and plot the route: easy and effective. Since I now have GPS in the truck I have gotten lazy. I didn’t even read the excellent travel directions on the ECARA flyer that announced the event. I just waited until 2 minutes before leaving on Saturday morning and punched the address into the GPS. I should have been suspicious when the first instruction was to get on route 95 south. Dayville is north, right? Well, I just followed the instructions (sort of like what I do when my wife speaks to me) and blindly climbed the on ramp for route 95. I had forgotten that my GPS routing preference was set at “Maximize Major Highways”. That one is good for long trips, but really stinks for local stuff. After some 15 minutes of travel time, now on the outskirts of Mystic, I got a bit worried. The ’58 minutes to go’ message on the GPS screen was also a concern. I pulled over and verified that I was going the right way but way out-of-the-way just to avoid small roads. I continued. I considered turning around and quitting. Finally I decided to just stick it out and arrive late. Of course, all the good stuff would be gone by the time I got there. When I finally arrived in Dayville (missed the opening by 45 minutes) there were no more parking spaces in the church parking lot. I threaded the pickup through the narrow lanes three times before someone finally left an open spot (another 10 minutes wasted). I went in and paid my $3 entrance fee to the nice lady and immediately merged with the circulating crowd. In case you have never been, an indoor hamfest or radio meet consists of numerous rows of tables with narrow paths between them. If two people stop to talk with each other and stand sideways all traffic stops. You can’t get by. If you are looking at something you need to make sure your gut is within three inches of the table edge so as to leave room for the shuffling crowd that never relents. That’s what a place with a good reputation is like; crowded. I spied an old radio of minor interest at the very first table, but I passed it by. I needed to get to the vendor who had all the tubes last year. His prices were great and he had almost everything I needed. I also just had to find someone with boxes of old knobs and dials. They always show up. I had prepared this time since I actually had dimensions and 3 samples (inside a clear sandwich bag) all ready to compare with whatever I found. After a couple turns around the room I had to admit to defeat. There were no tube vendors and nobody had any knob collections. This day was not getting any better. Well, it was time to check out the guy near the door. He had a couple old radios that looked like Atwater Kent bathtub radios. Maybe I could score a junker and use it for parts. When I got to the table the man’s wife immediately became my best friend after she saw me looking at the radio. “My husband can tell you all about it”. He did. He said it was an Atwater Kent. I commented that it was curious how the Atwater Kent had a Stewart Warner transformer in it. The 8 tubes (two 45’s, five 27’s, and one 80) were just what I needed. Notice the original inspection card in the left rear – it has about a dozen signatures on it. He didn’t seem to hear me but did explain how his collecting interests had changed and he needed to get rid of a few radios. His wife took me aside (literally) and emphasized that he had radios ” all over the place” and they really needed to make more room at home. At this point I noticed that he also had two nice looking compound microscopes for sale. The binocular model with the mechanical stage was especially nice looking. As I looked it over to see what it had (4 objectives including 100x oil with 10x eyepieces and a lamp) I took note of the tag ($40.00, As Is). I asked what feature was responsible for the ‘as is’. The seller was not sure but he finally pointed out that the slide lock had no spring to it and that was the only problem he knew of. I knew this was a great buy and so didn’t the ham who was now pressed against my right side like an old drinking buddy ready to sing an Irish ditty with me (it was March 16, almost St. Patrick’s Day). I said “I’ll take this” and the guy next to me said “It’s a good thing you decided because if you didn’t buy it I would have”. 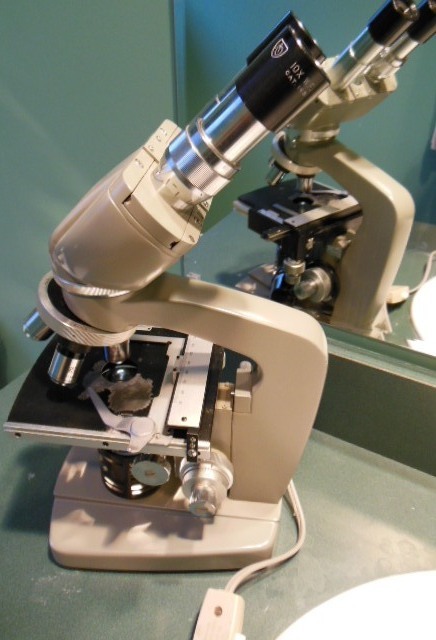 The Bristol scope has 2 10x eyepieces, 4 objectives including a 100X oil immersion, a lamp, and a mechanical stage. Quality made in Japan. Likely 1980’s. Now it was time to bargain. 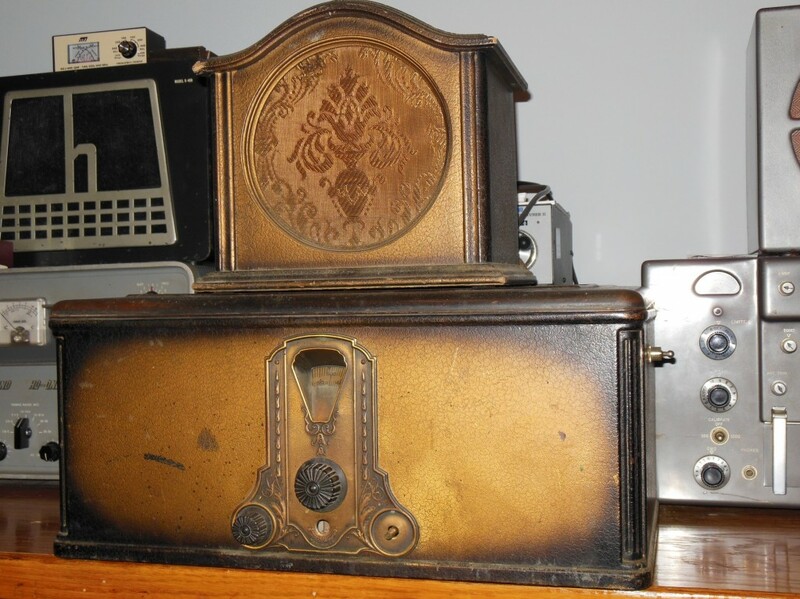 The Stewart Warner radio (20″ x 12″, all metal case, and matching speaker with tapestry design grill cloth) was priced at only $30 (marked down from $40). 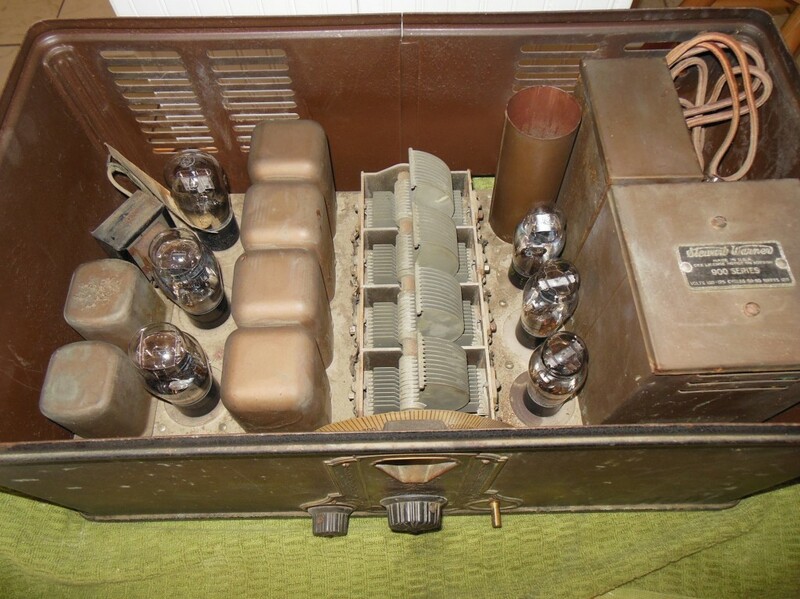 And yes, it had all its tubes including the 80 and 27 that I was looking for. I asked for a little discount, considering the microscope purchase (I was now officially an old customer) and how truly chummy his wife was with me. I got the whole deal for $65.00, a great bargain. The day was improving. It took three trips out to the car to load it all up. Each time I came back in the building I had to show my little red ticket. Once I saw an old ham acquaintance, Frank (KB1AWZ). He offered me his ticket because he was on his way out and would not be able to claim the door prize if they called his number (‘must be present to win’). I declined with the explanation that I was also in transit. I stowed everything in the back seat area of the Ridgeline on the floor. I wrapped the Bristoscope Bristoline microscope (made in Japan, not China) in some bubble wrap I keep around for just such an occasion. Next to it I put the 49-pound radio up against the back of the rear seat frame (mistake). I then reprogrammed the GPS for ‘shortest route’ (guaranteed to pass through residential areas, national parks, and cow pastures) to be sure I avoided route 95. All was well as I travelled through the sparsely settled country of Eastern Connecticut. Then I remembered the camera I had brought with me. I had not taken a single picture! Oh well. Wasn’t this the route where that old gas station was, the one that I always wanted a photo of? Is that a yellow caution light up ahead, right in the middle of nowhere (pasture country where stone walls rule)? No it’s a full traffic light and it just turned red! I hit the brakes hard and succeeded in stopping just a few feet beyond the stop line. I also heard something go crash against the back of my seat. That would be the 49-pound radio. The light turned green and I moved along, all the while looking for somewhere to stop. I had to get to the back seat to see how much damage I had caused to the antiques and to the truck upholstery. I pulled over at an area where the breakdown lane was about triple width (next to what looked like an old farm that was now a repository for retired trailers filled with junk that flowed out to the surrounding yard). All was well in the back seat. The radio had flown forward and was now against my backrest. I secured it in place by wedging in my packaged jumper cables so as to cushion against any other sudden stops. It looks like this place last pumped gas somewhere around 1978. I wouldn’t want to spend the night in one of these buildings. After closing the door I noticed what was across the street. 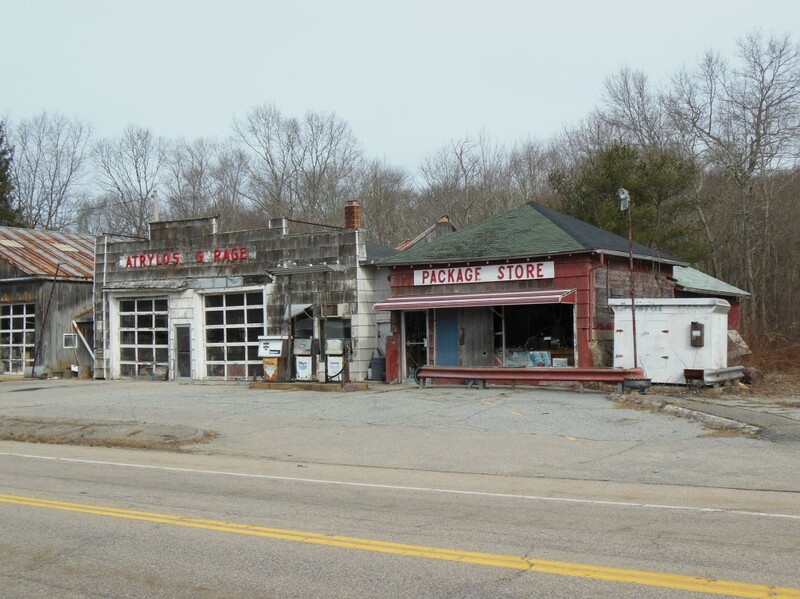 It was the long-abandoned filling station and adjacent liquor store. I had stopped right at the place that I had been planning to photograph for the last five years! Yes, the day was improving. I got out the camera and clicked away. These opportunities don’t come all that often. The rest of the ride home was uneventful and really short (now properly using the GPS). I’m going to be checking out a lot of pond water under the scope this summer while I work on accumulating parts for the new old radio. Oh, and that ‘as is’ stage clip; not a problem after I tightened its screw. Stewart Warner 900 Power Supply discussion found on page 52 of Fixing Up Nice Old Radios by Ed Romney. Radio Manufacturers of the 1920’s, Vol. 3, by Alan Douglas. See pages 150-151. The knobs on this radio have an interesting flower petal design. Notice the small skirt. 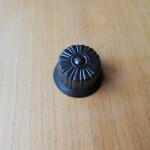 Some knobs similar to this one do exist without the skirt. 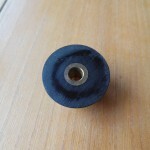 It is made of a Bakelite material. The underside conists of a brass insert and it is secured by a small set screw. This entry was posted in Occasional Commentary, Radio: Amateur & Broadcast and tagged 900, amateur, Bristol, Bristoline, Bristolscope, CT, Dayville, ECARA, ham, microscope, radio, RI, stewart, warner. Bookmark the permalink.